If you’re interested in introducing sepak takraw to your school or club then there are only two things you need, equipment and a plan! At the bare minimum all you need is some balls to get started teaching and practising basic skills, to start playing the actual game on court you’ll also need a net and some poles. If you’re teaching at a school you’ve likely already got some badminton equipment and court markings which is great because the net height and external boundaries are the same for badminton and sepak takraw! Now that I have equipment, how do I start teaching? Click me for the free booklet! 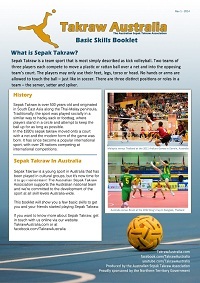 Whilst there are no off the shelf lesson plans available just yet,Takraw Australia has put together a basic skills booklet that is a great place to get started. It’s an eight page booklet that gives an overview of the history, how to play, and the four basic skills with instructional photos. It can also be printed in A3 to be put up as posters.